While my longtime friend Mark Bialczak slogs thru the slush and snow of Syracuse, New York, I’ll be sending him many warm regards for nominating me for the Dragon’s Loyalty Award this month. Mark is a prolific writer, and a news reporter with an eye out for a good story. As a former Syracusan, I naturally gravitate toward his column. But his entertaining stories reach beyond the interests of Central New Yorkers. I’ve also posted this award on my Awards and Acknowledgements page. Thank you, Mark. Forgive me for breaking the rules. I do appreciate your thoughtfulness. Judy, Judy, Judy, I am happy for you to put this badge on your pages and delight in its warmth. You have one little point incorrect, and since you are in Florida, I can’t blame you for it. But it is much too cold up here in Syracuse for slush. Ice, yes. Slush, not these last few days. Congratulations on your deserved award, my friend. Congratulations, Judy! 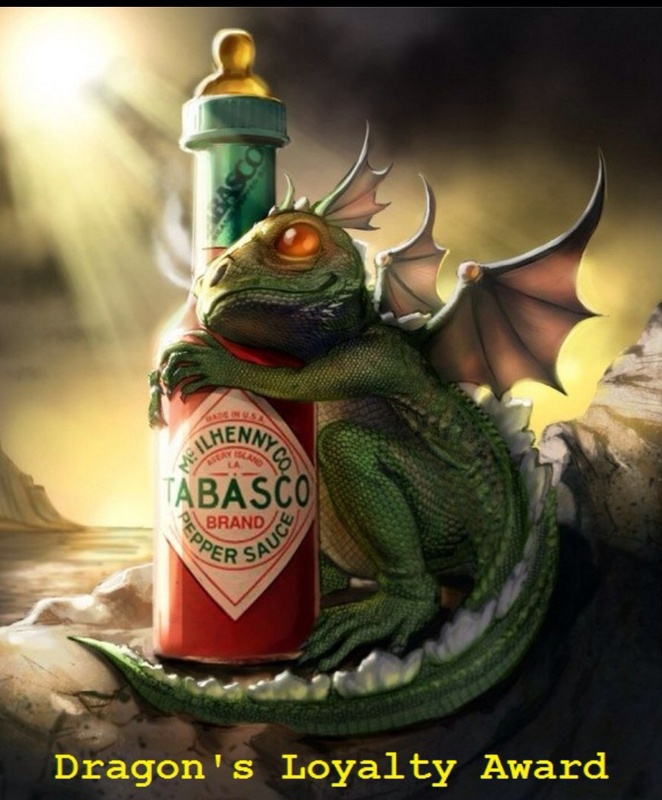 I hope you actually get a real dragon hugging the hot sauce–it’s wonderful–but even if you don’t, your writing deserves all awards! Brava! Thank you, Marilyn. As I recall, real dragons are MUCH bigger. So, it’s probably a good thing that one wasn’t included in the nomination. A super warm come back. Thank you, Island Traveler. Thanks, Madhu. It is a cute badge. Mark Bialczak also hails from the Syracuse area. I think he – and I – have only encountered cold hard cash that someone either dropped in the snow or put in the freezer for safe keeping. 😉 But I do like and, hereby, approve of your suggestion.